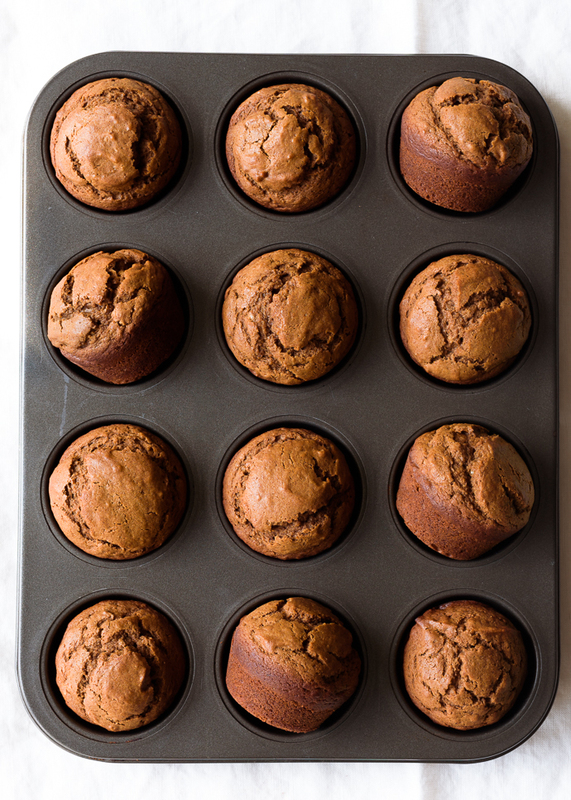 These flavorful pumpkin gingerbread muffins are an update to one of my favorite seasonal treats: the ever-popular spiced gingerbread muffins that I find myself baking up multiple batches of once Autumn rolls around and my kitchen becomes a blur of sugar and flour and any number of other delicious sweet things. There’s a dark chocolate banana version too. It’s one bowl recipe goodness that keeps on giving. They’re also packed with cozy fall spices, deep molasses notes, just the right amount of sweetness, and of course, the addition of pumpkin makes them basically a vegetable. This pumpkin gingerbread muffin recipe is nearly the same as my one-bowl spiced gingerbread muffins, with the obvious substitution of pumpkin for the mashed banana. Pumpkin is a natural choice this time of year – though I truly love it year round – and pairs wonderfully with the warming holiday gingerbread spices. I add dark molasses, dark brown sugar, and loads of cinnamon and ginger to the batter, and the result is a moist and densely-crumbed muffin with a craggly domed top, that beams with cozy caramel notes and holiday spice, a fresh hint of orange, and is a favorite winter breakfast treat around here. 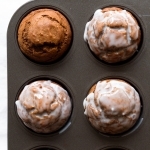 For an even more indulgent sweet treat, dip the muffin tops in the vanilla maple glaze, and transform the already lovely and flavorful muffins, into something akin to a gingerbread cake doughnut. Preheat the oven to 400° F. Line a 12-cup muffin tin with paper liners or lightly grease with butter or non-stick cooking spray. Set aside. In a large mixing bowl, whisk together the pumpkin and egg until completely combined. Whisk in the vanilla, orange zest (if using), spices, and salt. Add the oil, molasses, and milk, stirring until completely combined after each addition. Add the sugars, and stir to combine. Add the baking powder and baking soda, and stir to combine. Fold in the flour until just mixed. Do not overbeat. Use a cookie scoop to divide the batter evenly between the muffin cups, filling each about 3/4 full. Bake for 10 minutes at 400° F. Turn the oven temperature down to 375° F., and bake for an additional 7-9 minutes, until the muffin tops are set, and a cake tester inserted into the center of each muffin comes out clean. 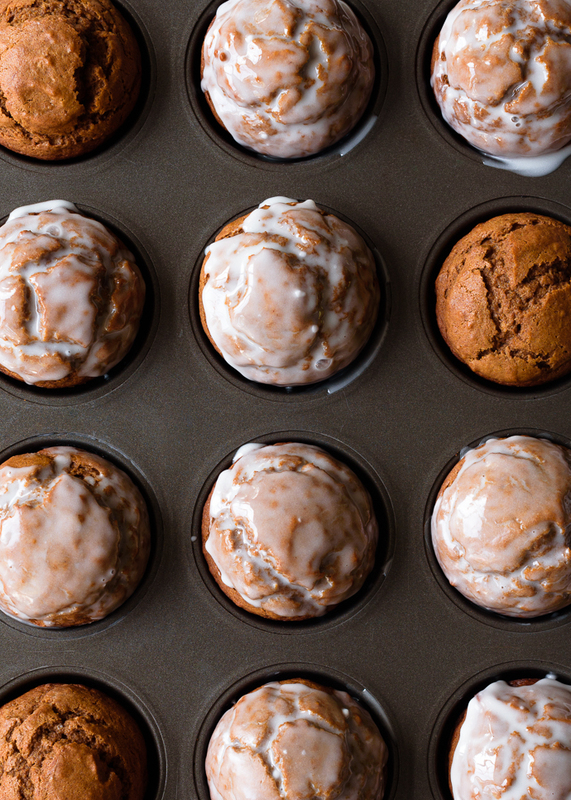 Let cool in the muffin tin for 5 minutes, then transfer to a baking rack to cool completely. Serve warm or at room-temperature. In a small bowl, stir together the powdered sugar and milk until the glaze is smooth and creamy. Stir in the maple syrup and vanilla. Add more or less milk to create a thicker/thinner consistency, if preferred. If glazing: While the muffins are still warm, dip the tops of each in the glaze, then place on a baking rack to cool and set. 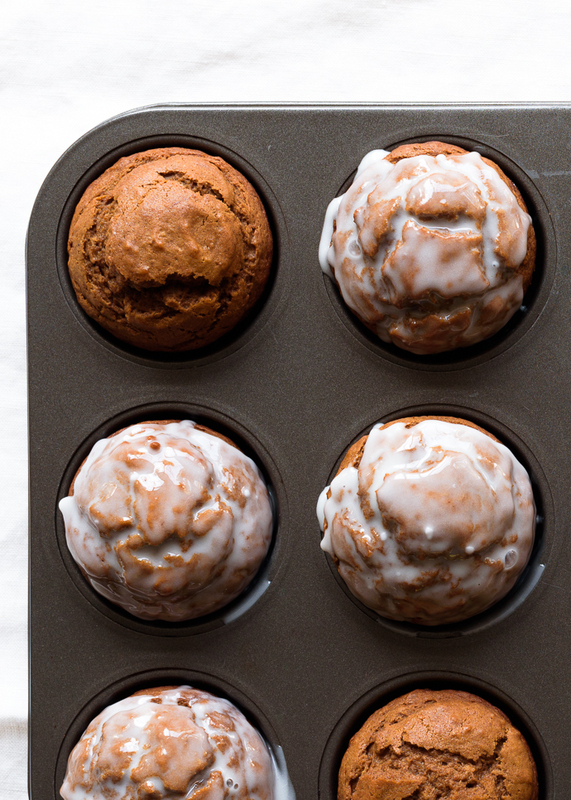 If frosting: Wait for the muffins to fully cool, then use a knife or small offset spatula to spread on the frosting. FANTASTIC! The batter tasted like caramel so I had to lick the bowl clean! I made these for my kids last weekend and they can’t get enough of them! Thanks for the recipe, I love your blog! There are many recipes that won’t allow you to print on this site. It is giving the 404 error for this recipe in particular, is there a way to fix this? I love having a printed copy of a recipe as I am working in the kitchen. 🙂 This one looks delicious! I don’t taste the pumpkin at all — the flavor was overwhelmed by the molasses. They tasted so-so on the first day, but despite careful wrapping they were hard the second day and I had to throw them out. Hi Robin – I’m sorry to hear that you didn’t enjoy the muffins 🙁 The pumpkin is subtle, and these do highlight the gingerbread flavors more prominently. Would you mind telling me how long you baked them for? I’m wondering if maybe the batter was overmixed, or maybe they were in the oven for a minute or two too long, which could have made them tough. Thanks for your feedback, I’m always looking to improve my recipes, even the favorites. I have a holiday potluck and would like to bring these. How should i adjust bake times if i wanted to make mini muffins? Hi, Blair! I haven’t made these into mini muffins, but another reader make my banana gingerbread muffins, which are very, very similar, into 48 mini muffins, and she said she baked them at 375°F for 10 minutes. Hope that helps! Happy holidays!! Yum! These must smell heavenly when they’re cooking. I love that they’re a one-bowl project! They do, indeed! Thank you, Joy! !